File manager apps are considered as the most vital apps on android smartphones. With the help of these apps you can easily browse your files, manage your storage space, and transfer the files and much more. 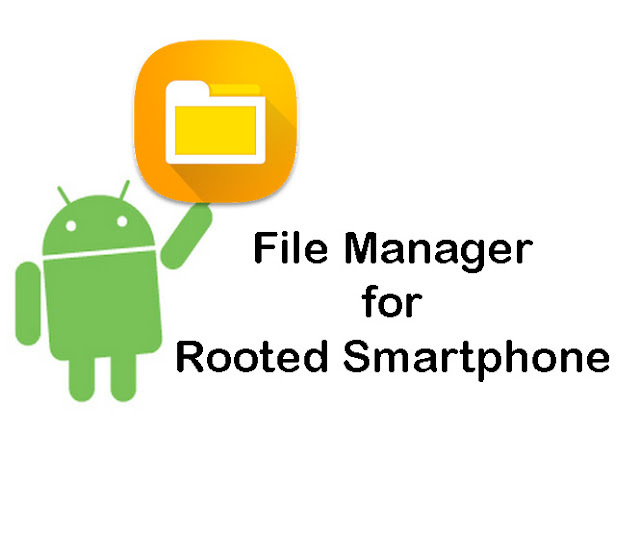 In this article we have discussed about the best file manager apps for rooted smartphones highlighting their features and functional capacities. Here is the top 10 best file manager Application For your rooted Smartphone. The best and advanced file manager - File expert enable you to manage the files from different locations in the SD card. Along with this, the app also manages RAM storage, ROM storage and cloys files. It enables you to browse files in a tree hierarchy or by its various categories or even by its last modified date with a fast search. It also consist of different premium features that you can unlock la carte, bundled with in app purchases. The app provides LAN access for ftp, sftp, ftps, SMB, WebDAV and clouds include Google Drive, One Drive, Drop box, Box, Yandex, Sugar Sync, GCloud and many more. You can also secure this app with an app lock so that your files remain protected. It displays the amount of files stored in your device and the size of each folder. This file manager app is built with new updated android system and grants its users with the best android experience. Accessibility of files from multiple locations. Create new files and new folders easily. Automatically sync data with cloud and manage history of sync data. It keeps the files secure, stable, customized and easy to access. Built with sophisticated android technology, thus providing best android experience to users. Show the number of files and size of the folder. Root spy is another best file manager app that allows the users to access files from the rooted smartphones. It also enables the users to view protected data files of android smartphones. One can easily download this app for free from playstore. It provides all the basic options like copy, paste, rename, move, search, share and many more. The files can be sorted by date, size, name or file type. Unlike other apps it does not show pop up advertisement. You can create new folders and files in no time. The rooted users have to enable the super user option which comes in the app settings under the advanced option. To enable more such options just long press on any file. Search option is available to search data files. Copy, paste, delete, rename, search and explore the files. Enable search option, add bookmarks and changeable settings. It compresses and decompresses the files. The app display protected files of phone. You can sort the file by size, name, and date or file type. File explorer root browser comes along with easy customization of theme. In addition to this, you can also change the color. It provides a three icon pack containing options like circle, square and flat. The app possesses the benefits of copy, paste, rename, compress, delete, move etc from one place to another. Through the countless benefits of this app you can also manage the cloud storage such as drop box, Google drive and one drive. It is a trusted app that provides you to access the lower level of android management including the app data folder. It brings the MD5 support, an APK binary XML viewer and lot more. You can easily transfer the files from the storage folder to cloud storage. It enables you to access audio and video files. Send a file or group of files by mail directly. Perform basic functions of copy, paste, rename, and delete files from device. It can install and add the files anywhere on your device. Share the files to Box, Drop box, Google Driver and One Driver. Easy to customize themes, icons, layouts. Root file manager is an easy, simple and convenient to use file manager app. It is the best alternative for the rooted Smartphone users. The app allows you to browse your memory card, rename, copy, paste and move files. It is supported in different languages like English, French, and Spanish etc. It provides you to access the whole android system including the security file system. You can manage and browse the files on your device which is not possible with the default android file manager. It also gives excess to hidden data which is secured like the data of the games and apps you have downloaded earlier. You can use the multiple tabs at one time as like browsers. The app featured SQlite database viewer, share files via Bluetooth, mail and many more advantages. Create new files and folders on rooted smartphones. Modify file permissions and ownership. Share the files via Bluetooth or mail. For easy access support folder shortcut on favorites’. Rename, copy, paste folder and files. EZ file manager is an app that is compatible with almost all rooted devices. It allows you to access files and manage them for free of cost. It provides multiple assistance of running applications, managing cloud drive storage and FTP client so that you can access it both on your phone or PC. Watching movies, videos, uploading photos and using 3g connection become easier with the help of EZ file manager. You can browse your files and copy, paste, rename, and move from one location to other location as you do on desktop. Moreover it sends the files to other devices with Bluetooth or with email facility. The app has a smooth interface and stands out for the option of connecting your accounts on Drop box, one drive and Google drive. It includes a space analyzer that boost up the memory to restore more space. The app also has an app manager through which you can backup or uninstall any app according to your preference. Compress or decompress files with zip or rar support. Directly send files to mail or other devices. Protect files and folders with password security. Transfer the storage from internal memory to SD card. This app is really great and unique in its features which are not available in other apps. It is a paid app but you can install trial version of 14 days from playstore and then buy it for regular purpose. There are various options in solid explore file manager including WedDav, SMB, compression support, and theming options along with. Initially you can use the app for free for some days and then it costs $1.99. Solid explorer is undoubtedly an astonishing app with number of plugin and support system. Pleasant themes, colors, icons all together constitute it the most powerful and beautiful application. The app comes with extremely easy user interface and incorporates a main shortcut for all its folders and files from which you can access the sub folders quickly. Apart from this, it offers the benefits of locate or extract your multimedia files like music, photos, videos, audios so that you can locate the necessary ones likewise. The main positive point of solid explorer file manager is that it contains two independent windows through which you can transfer the file from one folder to other folders without any difficulty. Along with managing files, the app works with ZIP, RAR and TAR packages so that you can access the required files that are protected. Simple design and easy interface for users. Directly drag and drop files between panels. Options contains material design, root access, cloud support, SMB etc. Ability to compress or decompress files. Stream videos to chrome cast. Total commander is a popular app consists of network storage support, plugin support, bookmarks and other beneficial tools. This app is available free of cost with no in app purchases and advertisements. It is a complete tool to access files that offers a number of advantages. There are various options for customization including colors, menus, icon sizes and more. The app has a traditional dual pane interface, easy drag and drop files, and allow users to use it’s featured with easy to remember keyboard shortcuts. Total commander can be considered more beneficial for designers, developers, programmers who are supposed to upload and download file to and from remote servers. The app contains an in built support for creating ZIP archives. It offers you full control over your folders and you can modify the permissions. Copy, move, paste, files easily. Drag and drop files from one location to other. Directly stream media player from LAN, WedDav, and cloud plugin. Select by clicking on file icons. Amaze is a new and good file manager app that is pretty good for users who want light experience in light browsing files. If you want to buy funds, then the app provides optional in app purchases. This app attracts the users with its clean, simple and elegant interface. Even the users can modify its themes, colors according to their choices. Besides the common benefits, the app provides the shortcuts for the directories you access frequently. Another exciting feature of this app that will let you download it within no time is that it can free up space from your memory of the android. Though it is a new app but offers certain powerful benefits thus inducing users to avail its uses. Basic options like cut, copy, paste, rename, move or delete. Various themes with cool icons. Access history bookmarks or search for any file quickly. Access to multiple tabs at once. MK file manger has a great and simple user interface. It contains two panels to manage files. You can easily move, copy, paste files between two panels. There is also a side bar for quick accessibility of any folder that you added to bookmarks. This app is basically recommended for devices having older versions of android such as Lollipop, and Marshmallow. Though the app does not provide support to cloud or network storage, but it consists of many important highlights such as search tool, built in text editor, music player, gallery and also supports various languages. In total, it is an amazing application and you can download this file manager app for free from play store. Built in gallery, text editor, and music player. The app supports 20 distinct languages. Astro file manager is a powerful customized app that allows users to manage files between internal storage, SD card and cloud networks. It has an outstanding feature of in built file manger that is useful in terms of downloading large files. The app has a smooth and simple user interface that shows the different categories such as storage location or cloud services. It comes along with SD card usage manager that enables you to deal with the space and clean memory, a task killer that save the battery life and an app manager where you can uninstall or backup files. Additionally it compresses and extracts files, access LAN or SMB and provides all other essential features. Allow local and cloud storage management. Manage files between SD, internal storage and cloud networks. Add bookmarks for quick access to files. Manage storage space and boost battery backup. Built in file manager for downloading large files. So these are the best 10 file managers for rooted Smartphone. These apps truly come easy when it comes to organize the rooted phones. So what are you waiting for? Give it a try.